The Native American woman was the guardian of the hearth and, on occasion, ruler and warrior, managing the affairs of her people, sporting war paint as well as necklaces and earrings. Sometimes she was a visionary and a healer, sometimes mother and matriarch. She built houses and ground corn, wove blankets and painted pottery, played field hockey and rode racehorses. Frequently she enjoyed an open and joyous sexuality before marriage. The book surveys dozens of North American tribes to explore the chronology of the Native American woman's life from childhood through puberty, marriage, old age and death. 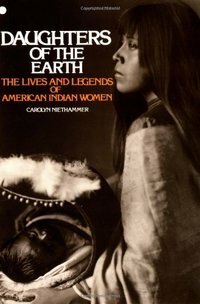 The Native American woman emerges as a proud, sometimes stoic always human individual from whom those who came after can learn much. The stories of these early women are enhanced with the fables, songs and incantations that were part of their cultural and spiritual lives.